Set in 2015 in Brussels, Belgium, Nowhere Boy is the story of two young teens who develop unbreakable bonds of friendship in the face of loss, racism, immigration politics, and betrayal. Ahmed is a 14-year-old Syrian Muslim refugee who is homeless, orphaned, and hiding in the wine cellar in the basement of a house near the Ecole du Bonheur, or ironically, “School of Happiness,” as translated from French. 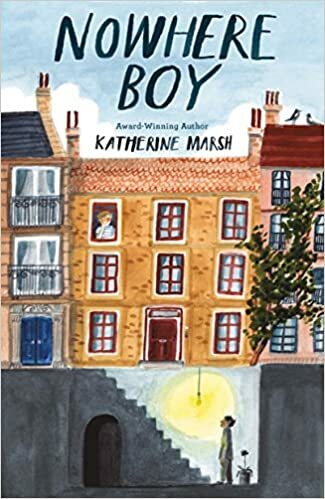 Max is a thirteen-year-old American whose family has moved for one year to Brussels from Washington, D.C. Much to his chagrin, Max’s parents have him repeat sixth grade at the School of Happiness and expect him to learn French in the all-French school. As Max’s home life and school life bring him nothing but hard work and loneliness, the astonishing discovery that Ahmed has been living for months in the basement of Max’s house brings Max welcome respite from his own misery. After learning Ahmed’s heart-wrenching story of loss upon loss with no home to run to, Max begins to assist Ahmed by providing meals, books, and even rare, precious opportunities to leave the dark, dank basement. The duty of caring for Ahmed fosters in Max a newfound sense of responsibility and inspires Max to seek a better, softer existence for Ahmed. The 2015 Paris attacks and the 2016 bombings in Brussels create an atmosphere of suspicion and hypervigilance that interferes with Max and Ahmed’s attempts to bring Ahmed out of hiding, and the two boys quickly learn whom they can and cannot depend upon. In Nowhere Boy, Edgar Award-winning author Katherine Marsh paints a multi-faceted portrait of the effects of war, terrorism, loyalty, and love. Readers will view both sides of the endless debate over which, when, and how many immigrants countries should allow over their borders, and will delight in thrilling police chases, close calls, and the ingenious ways that Max and his new friends assist Ahmed in his desire to go to school. A story of friendship, Nowhere Boy is also a story of survival, redemption, forgiveness, and adventure. There are so many ways and reasons one may choose to behave with courage: for love, in the face of fear, with a sense of hope, out of compassion, perhaps from a sense of duty. Regardless of the deed, the courageous acts of the protagonists in Nowhere Boy will resonate with the reader. What would you do if you saw yourself die in a horrific car accident, and a man among the crowd of onlookers at the scene of the wreck beckoned you to come with him? What choice would you have? Thus begins Devon Taylor’s debut novel, The Soul Keepers. After watching himself die, teenager Rhett Snyder makes the choice to follow this mysterious man, Basil Winthrop, and as such, his new life after death begins. 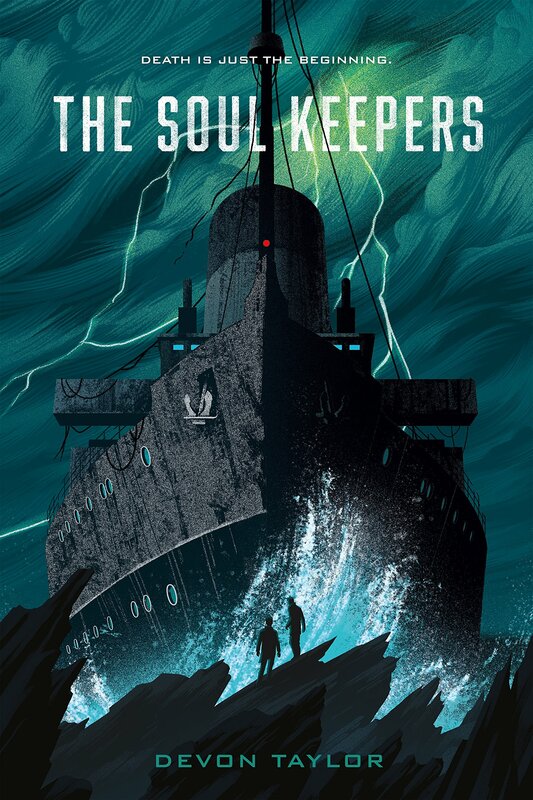 Throughout this fast-paced, suspenseful novel, the reader follows Rhett as he is taken aboard a massive ship, the Harbinger, and learns that he is a syllektor–a collector of souls. As a syllektor, Rhett must not only collect and transports souls from all over the world, but must also fight off the horrifying Psychons, soul-eating monsters, and Urcena, the speaker of languages who wants to destroy the Harbinger and all who dwell on board. Non-stop action, thrilling fight scenes, and much suspense and intrigue will keep readers on the edge of their seats as they journey through both the present and the after-life with Rhett and his team. Devon Taylor’s debut novel is not just about monsters. Rhett’s after-worldly experiences also invite readers to contemplate universal themes like friendship, team work, sacrifice, love, and the strength and power we each have inside ourselves. The novel concludes with a hint that this book is just the first in what might be many more Soul Keeper adventures. Crime looms large in Morriston, Abby Hamilton’s hometown. Without the help of superheroes like Red Comet, the community would be completely taken over by criminals. Most high school juniors like Abby would not be concerned with crime rates and superheroes who are celebrated like rock stars, but Abby isn’t most people. Her father is Morriston’s mayor and her chugging-milk-from-the-carton older brother, Connor is none other than Red Comet, the crime fighting superhero with a huge fangirl following. Abby does her best to live a normal life in the shadow of her father and brother, and is excited to finally shine as the lead in her school’s fall musical, until Iron Phantom, a new and mysterious superhero, rescues her from a mugging on her way home from rehearsal. There is something different about Iron Phantom that peaks Abby’s curiosity. When the possibility arises that he is not a superhero at all, but a supervillian, Abby has to make a decision. 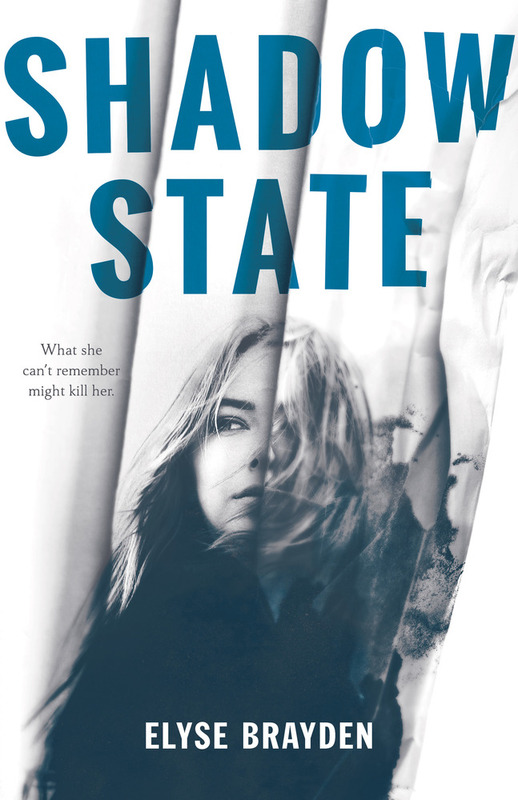 Should trust her feelings for Iron Phantom, especially after he claims to have proof that city hall, which is run by her father, is planning to implant citizens of Morriston with nanobots in order to control their minds and to help fight crime. 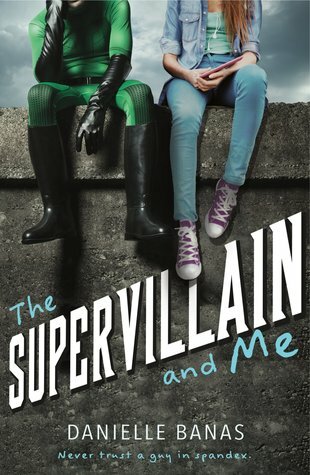 After getting its start on Wattpad with millions of views, the print version of The Supervillian and Me takes what teens love about Marvel and DC films, adds in a love story with mistaken identity, and a mix of relatable family issues that will leave fans of superhero stories hoping for a sequel. Brynn Caldwell used to be a straight-A, Ivy League bound, science wiz. But that was before Jacob. Brynn fell into a depression after their toxic relationship, and after various treatments, Brynn is trying to put her life back together. She is focused on school, dating a sweet boy named Dex, and hopeful she can reconnect with her best friend, Lexi. Despite her attempts for a normal year, Brynn’s safety is at risk. She is being followed, getting mysterious text messages, and having flashbacks that suggest she may be involved in a possible terrorist attack. Brynn’s mother discovers a treatment for PTSD. However, Brynn’s memories, messages, and desperate investigation to figure out what happened reveals that the treatment may not be ready to launch. It may have some serious side-effects that include memory deletion, and she’s worried about how many of her loved ones and others have been secretly treated and affected. It seems the government may have other plans for its use beyond PTSD treatment. Elyse Brayden’s first novel is a fast-paced mystery with a surprise twist at the end. The narrator is relatable but unreliable, as are many of the characters. You’ll wonder who can be trusted and how everyone connects. Poor Brynn is still learning to cope with her depression, and so while you question her actions at times, you cannot help but root for her to heal and solve the mystery. Fifteen-year-old Grace’s world is vivid. Color, sound, and touch are alive with an intensity that others can only imagine. Grace has Asperger’s Syndrome. Both her family and her close friend, Anna, support her as she tries to navigate school and adolescence. But all this care does not allow Grace to escape petty and cruel classmates, changes in her family, and a first love. 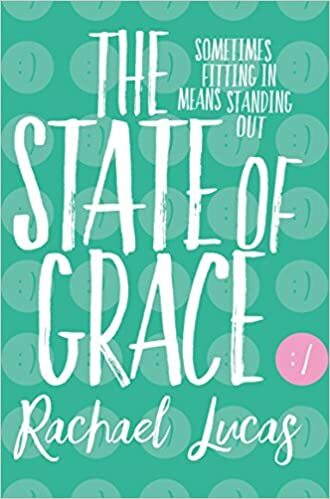 Through Grace’s narration, reader will experience all the confusion, fear and excitement as she attempts to control herself in challenging circumstances and be brave in new ones. Grace’s efforts to remain focused and calm are bolstered through the care of her horse, Mabel, the stable manager, Polly, and the new boy in school, Gabe. Gabe’s sensitive response to and interest in Grace helps her experience a whole new range of feelings. At home, Grace senses a change in her mother as the result of her mother’s friendship with a former classmate, Eve. Lucas’ novel is both touching and refreshing. She paints a sensitive but not overly sentimental picture of how one autistic teenage girl fails, succeeds, and grows. Unnatural Disasters is set in the near-future where the world does not appear to be that much different than what we are experiencing today. Extreme weather ravages the planet, fanatical groups plot global takeover, and refugees flee their countries with nowhere to turn. Luc and her boyfriend Luke have mapped out a plan. After graduation, they will get out of town and see the world before it is all gone. On the night of senior prom, a bomb is detonated in Washington, D.C. The devastation it causes throws the world into an apocalyptic state. Locating the next leader in-line for the presidency and closing borders becomes a reality. No one steps forward to claim responsibility for the attack, but all of the world’s powers are recklessly acting out against their enemies. Luke’s religious extremist parents decide to follow their church to South America for a second coming, and Luke chooses to go with them, leaving Lucy alone with no future plans. After several days of shutting out the world, Lucy attempts to return to school and find some normalcy in her life. She moves from place to place, disengaging from her old life, feeling as though she is nothing more than an observer. Memories from Lucy’s past come into focus and play a significant role in shaping a new world from which Lucy can’t escape. 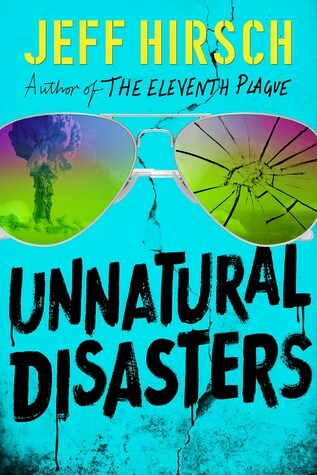 Unnatural Disasters gives readers a new perspective on an apocalyptic and post-apocalyptic world. It is a future that readers will find easy enough to imagine, but difficult to accept. Lucy is a typical teen, struggling to grow up and make sense of the world around her as people and places become more and more foreign. Readers will hypothesize how the characters will react, but also how they might react in Lucy’s shoes. Still coming to terms with the tragic loss of her boyfriend in a car accident, Natalie’s parents take her on cruise for her seventeenth birthday. Natalie is joined by her three best friends, who view this cruise as an opportunity to help Natalie move on. On the first day of the cruise, Natalie meets a witty, charming, handsome guy. After a conversation on a secluded deck of the ship, Natalie returns to her cabin to get her swimsuit so they can go for a swim. But when she returns, he’s gone. The only evidence that this new boy was even on the ship is a selfie on Natalie’s cell phone and his shirt hanging on a deck chair. Later, everyone is ordered to go to their cabins for a headcount and Natalie is afraid that he fell overboard. Natalie’s friends cannot understand why she is concerned about someone she has only known for a few hours, but are there to support her through some tough love. 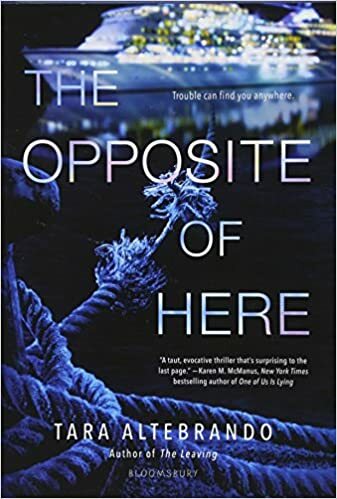 The Opposite of Here is a thriller with several twists and turns as Natalie works through the complex feelings of the death of her boyfriend and the strange disappearance of this new love interest. Altebrando also addresses the complex issues of friendship and what to do when those friends are not who you expected them to be. Emma is bright, driven, kind, thoughtful, and desperately lonely. Refreshingly proud of her intellectual talents, she is nonetheless feeling isolated and dejected, having resisted peers’ attempts to socialize with her for years. Enter her new foster brother, Dylan. His dark eyes, scars, and a mysterious past will stimulate readers suspicions. Dylan’s kindness encourages Emma to join the dance team and find community at school. She, in turn, slowly unpacks Dylan’s traumatic personal history, and helps him feel grounded and stable. Each fulfills everything the other’s heart desires. There is one problem- they are about to become brother and sister. As they study Wuthering Heights in class and enact its plot in real life, Dylan and Emma are torn between their intense romantic desire for each other and social mores. Brownlee avoids sexual explicitness while exploring significant questions like: What are our obligations to ourselves and to each other? How does love begin, and how can it change and grow? Brownlee’s secondary characters also enrich the plot. The frustrated parents’ attempts to understand their new household dynamic resonates, and Emma’s “boyfriend,” a fellow student she manipulates in order to deflect attention from her secret relationship, is drawn with sensitivity and grace. 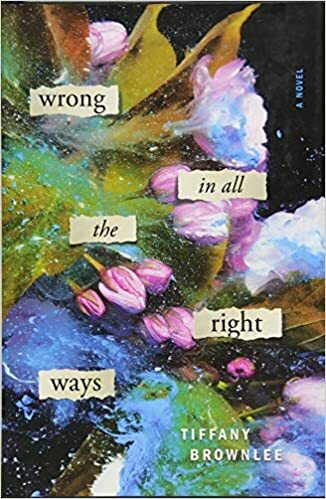 Wrong in All the Right Places will attract not only fans of Bronte’s novel, but readers interested in how teenagers negotiate love, ethical dilemmas, and family. Kate has always been pushed to be the best swimmer she can be, but when her home life falls apart due to an unacceptable action by her father, her life is thrown into rough waters. She and her mom move to a new home and Kate finds herself going to a new school and trying to start over. She has to decide how important swimming is to her and whether or not she can get past her anger and resentment as a result of her dad’s actions, especially since he was also her swim coach. At her new school, she struggles with old and new friendships, while trying to do the right thing, which doesn’t always go so smoothly. When Kate meets Michael, her new neighbor, they form a friendship built on both of their needs. Michael needs some help with swimming, and Kate just needs something that can help take her mind off her current situation. Kate and Michael work through their struggles and triumphs together, which draws them closer as friends on the way to becoming something more. However, additional roadblocks must be navigated, such as Michael’s girlfriend. As Kate is deciding which path to take in her new life, she is also dealing with the rawness of whether or not competitive swimming is part of that life. Skinner brings together the funny and emotional turmoil of growing up that every teenager experiences in life. She finds a humorous way for readers of any age to relate to the not-so-straight paths we must take in order to make important decisions in life, while still experiencing the stumbling blocks that help teach us how to create a satisfying life for ourselves. Through Kate’s journey beyond hurt and disappointment, Skinner reveals that we can all find our own type of forgiveness as a way to deal with some realistic struggles that are a part of life. To the living, Westminster Cemetery, resting place of Edgar Allen Poe, may seem like a typical graveyard. However, each night when the clock strikes midnight, its residents come to life, including seventeen-year-old Sam, a Civil War veteran and self-described poet. One evening, Sam is writing his poetry when he stumbles across sixteen-year-old Lacy Brink and immediately falls in love. Unfortunately for Sam, Lacy doesn’t understand that she is dead. Her screams summon the wrath of Mrs. Steele, the head of the cemetery’s Etiquette Committee, who dislikes Lacy upon first laying eyes on her. Mrs. Steele quickly becomes determined to serve Lacy three strikes for violating the resident rules, which would result in Lacy becoming Suppressed, doomed to live out her days within her grave before her afterlife has even begins. 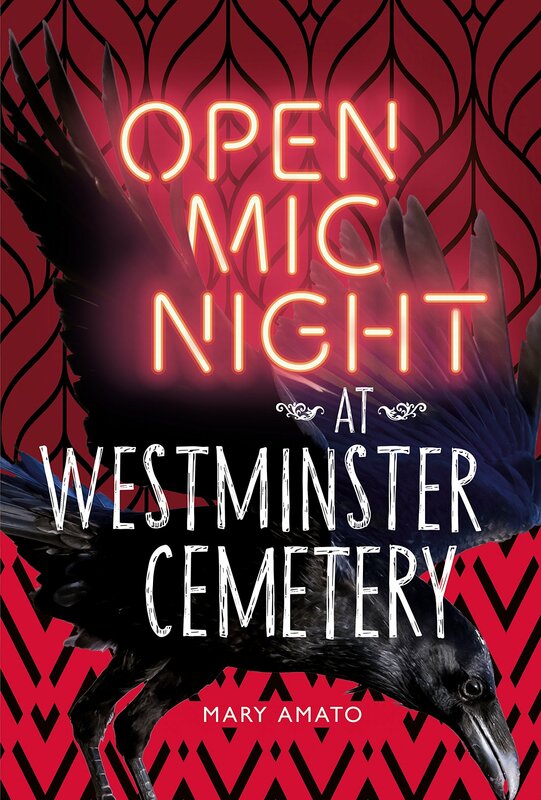 Lacy receives two strikes, and when she is given the position of President of the Entertainment Committee, decides to host the first ever open mic night at the cemetery. Like Sam, she also writes poetry. Unfortunately, Mrs. Steele makes sure the open mic is a disaster. Lacy is determined not to give up and, with the help of the other residents, devises a plan to create an even better open mic night, one that brings out all the residents, including the Suppressed Edgar Allen Poe, while keeping Mrs. Steel far, far away. Can Lacy pull it off without receiving her third strike, or ruining her relationship with Sam in the process? Mary Amato, author of Guitar Notes, has created a unique young adult novel that blends genres and points of view. Written in the style of a stage play, readers feel as if they are another presence alongside Westminster’s residents, while also having intermittent, practical conversations with the narrator in witty asides. Open Mic Night provides an excellent jumping off point for discussion on author style, while giving readers the opportunity to explore death from a humorous standpoint. 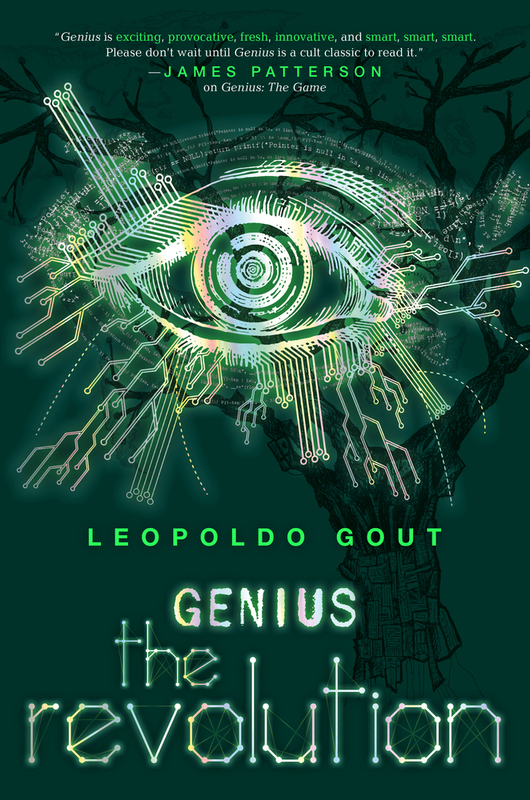 The last installment of Leopoldo Gout’s Genius trilogy takes the reader from Beijing to Patagonia with stops in Mexico City and Arizona. The book starts with the six day countdown to Shiva or what Kiran calls the plan to change civilization for the better, a world full of equality. Kiran says he wants to reorder the world due to the widespread suffering of violence, poverty, and environmental changes, but he really wants to create a world full of destruction. Kiran has promised his brain trust workers that he will make the world a better place, but his real goal is to turn the world into chaos through Shiva, a deadly internet virus. The LODGE crew of Cai, Rex, Tunde, and Teo want to stop Kiran. Three hours after landing in Beijing, the LODGE hatch a plan to help Cai’s father escape from the Municipal 23 detention center. This fails due to circumstances beyond their control, so the next goal is to delete the Terminal faction who could unleash their own havoc around the world. They succeed and then join ULTRA, a group of three teenagers named Ivan, Stella, and Javiera who have similar plans to save the world from Kiran and his evil Shiva virus. ULTRA and LODGE team-up, and fly to Mexico City where Kiran has a black box lab full of his brain trust workers. Through a unique plan to release four hundred helium balloons above the lab, ULTRA and LODGE work together to foil Kiran’s plans. The balloons provide a digital bubble as a way to communicate with the brain trust workers in order to share the news of Kiran’s real plans to turn the world chaotic. Gout’s suspenseful and fast paced plot provides the reader with an adventure series like no other. The diverse characters are exciting risk-takers and daredevils willing to save the universe to protect civilization. The connections to technology and the hacker culture will surely draw in today’s youth.